진주 청곡사 대웅전에는 목조로 만들어진 석가모니불좌상을 중심으로 좌측에는 문수보살좌상이 우측에는 보현보살좌상이 봉안되어 있다. 현재 이 삼존불은 제작 당시에 기록된 자료가 발견되지 않아 제작자 등의 불상에 대한 정확한 유래는 알 수 없다. 하지만 건륭 15년(1750)에 기록된 ‘불사동참결연작복록(佛事同叅結緣作福錄)’에서 “만력사십삼년을묘불상조성(萬曆四十三年乙卯佛像造成)...” 이라는 불상의 제작연대가 적혀있어 1615년에 조성된 것으로 추정된다. 본존의 석가모니불좌상은 신체비례가 알맞고 자세가 안정감 있다. 머리는 둥근 복발형에 높게 솟은 정상계주와 중간계주가 표현되어 있다. 방형의 상호는 이마가 넓고, 반개한 눈과 넓고 편평한 코, 굳게 다문 입술 등이 조화를 이루어 엄정한 인상을 풍긴다. 볼과 턱에는 적당히 살이 올라와 있으며, 두툼한 귀는 턱까지 내려와 있어 전체적인 상호가 원만하다. 넓은 어깨의 네모난 상체를 가졌지만 가슴은 편평하고 아랫배는 부풀어있다. 수인은 오른손을 무릎아래 살짝 내리고 왼손은 오른발 위에 자연스럽게 올려놓아 손가락을 구부린 항마촉지인을 결하고 있다. 하체는 오른발이 왼쪽 무릎위에 올라온 결가부좌로 넓고 낮아 안정적인 자세를 취하고 있다. 착의는 변형의 편단우견이며 가슴까지 올라오는 승각기는 의대(衣帶)로 묶어 꽃잎형 주름이 나타난다. 왼손에서 내려온 소매자락은 무릎위에 올려진 오른발을 덮고 왼쪽 무릎 위에 꽃봉오리 모양을 이루었다. 다리위에 흘러내린 대의자락은 양 다리를 감싸고 4단의 부채형 주름으로 표현되었다. 좌·우협시인 문수·보현보살좌상은 좌·우 수인의 위치와 좌·우 어깨를 덮는 이중착의 형식만 다를 뿐 상호와 신체비례 등 전체적인 조형은 본존과 동일하다. 각각의 두 보살좌상의 상투는 높은 편이며 귀를 휘감은 보발은 귀 뒤쪽을 타고 내려와 어깨 위에서 조그만 원을 중심으로 두 개의 타원을 형성하고 세 가닥으로 나뉘어 흘러내렸다. 보관은 높고 섬세하게 표현되었으며 이와 반대로 보살좌상의 영락장식은 단순하게 작은 귀걸이와 팔찌만 표현되었다. 청곡사 목조석가여래삼존불상의 제작자는 관련 기록이 현전하지 않아 알 수 없지만 상호의 표현과 신체의 비례, 착의의 표현 등이 1629년 조각승 현진이 조성한 관룡사 목조석가여래삼불과 유사하다. 청곡사 삼존불좌상은 현진작 불상 중에서 앞서 조성된 1612년 월명암 목조아미타불좌상보다는 얼굴이 편평한 방형으로 바뀌며 당당한 신체표현의 변화가 나타난다. 하지만 이후 제작된 관룡사 삼불좌상 보다는 형식화 되지 않았으며, 옷주름의 표현 등이 자연스럽고 상호의 모습도 안정되어 있다. 또한 본존은 170cm의 대형 불상으로 현전하는 현진 작 목조불상 중에서 비교적 큰 규모를 자랑하는 수작(秀作)으로 현진의 양식연구에 중요한 자료적 가치를 지니고 있다. 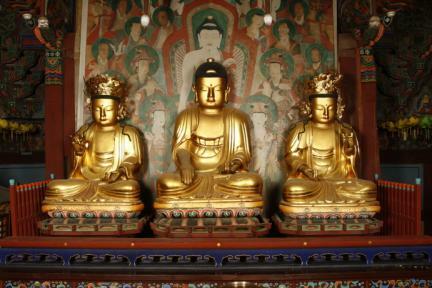 This Wooden Seated Sakyamuni Buddha Triad is housed in Daeungjeon Hall of Cheonggoksa Temple in Jinju, flanked by two other statues representing Manjusri Bodhisattva and Samantabhadra Bodhisattva, placed to its left and right. As no record related to the creation of this Buddha triad has been discovered, no background information is currently available. It is, however, more or less precisely known that they were made in 1615, based on an inscription added in 1750. The statue of seated Sakyamuni Buddha, the main Buddha of this triad, is well proportioned with a stable seated position. The head has a high-rising top half sculpted with top and middle cudamanis. The forehead on Sakyamuni’s square face is broad. The eyes are half-closed, the nose rather flat and the mouth tightly sealed. The resulting facial expression is quite strict. The cheeks and the chin are fleshy, and the ears, also rather fleshy, have their lobes descending all the way to the chin level, giving the Buddha an overall good-natured face. The torso under the broad shoulders is rectangular in shape. The chest is flat, and the lower belly protrudes somewhat. The Buddha’s right hand is held slightly below the right knee, and the left hand resting on the right foot has fingers bent inward, in the bhumisparsa mudra. The wide and low-rising lotus position in which the right foot is resting above the left knee appears stable. The robe draping from the left shoulder leaves the right shoulder bare, but in a style slightly in departure from the standard left shoulder-hung robe. The top of the inner garment visible on the exposed chest is tied with a string and shows floral-shaped folds. The edge of the left sleeve covers the right foot above the left knee, forming the shape of a flower bud. The robe unfurled over the legs covers them from either side and has handheld fan-shaped folds distributed in four tiers. The two attendant Bodhisattvas seated to his left and right, Manjusri and Samantabhadra Bodhisattvas, are essentially identical to the main Buddha in facial features and bodily proportions, outside the inverted position of the mudra and the way the robe and the inner garments are worn. The two Bodhisattvas have a rather tall topknot of hair, and the rest of the hair runs down from behind the ears and branches, on the shoulders, into three separate bunches, two of which are elliptical in shape, and the one in the middle round in shape. The tall jewel crowns are provided with intricate details, while the bead ornaments are not the most extravagant, consisting only of a pair of small earrings and a bracelet. No record identifying the maker(s) of the Wooden Seated Sakyamuni Buddha Triad of Cheonggoksa Temple has survived. However, the three statues are quite similar, in terms of facial features, bodily proportions and drapery treatment, to the Wooden Sakyamuni Buddha Triad of Gwallyongsa Temple, carved in 1629, by the monk sculptor Hyeonjin. Compared, for example, to the Wooden Seated Amitabha Buddha of Wolmyeongam Hermitage, an early sculpture by Hyeonjin, the Wooden Seated Sakyamuni Buddha Triad of Cheonggoksa Temple stands out for the square and flat face and the robust body; hence, embodying later characteristics that are absent in the former. On the other hand, compared to the Seated Buddha Triad of Gwallyongsa Temple, these characteristics are less salient and stylized in the triad of Cheonggoksa Temple. The drapery folds remain highly natural, and the facial features harmonious. The main Buddha of this triad, measuring 170cm in height, is one of the larger-sized works of Hyeonjin, at least among the surviving works of his, as well as a highly accomplished piece of sculpture, and is considered of great significance for research into the sculptural style of this monk artist.